Some of the viruses, bacteria, parasites, and fungi that cause infection inside the body can also develop in the eye, leading to an eye infection. Some possible eye infections include conjunctivitis (where the conjunctiva becomes inflamed), blepharitis (affecting the eyelid), keratitis (the cornea), vitritis (the liquid inside the eye), chorioretinitis (the retina and related blood vessels), or neuroetinitis (the optic nerve). Infectious conjunctivitis, which is usually caused by bacterial, viral, or fungal infection, is the most common form of eye infection. Other infections that can cause inflammation of different parts of the eye include STIs (such as syphilis and gonorrhea), tuberculosis, Lyme disease, certain parasites, or mycosis (a general term for a fungal infection). Even if your symptoms are mild, it is a good idea to get your eyes checked by a doctor to ensure that you are getting proper treatment. Make an appointment to see one of our team by calling or using our online booking system today. How can I avoid spreading an eye infection? Avoid rubbing or touching your eyes. Regular washing of your hands is important to stop the infection from spreading. It is also a good idea to avoid sharing pillow cases, towels, and make-up. Can I get an eye infection from a swimming pool? Swimming pools usually contain chlorine, which kills the bacteria that cause infection. If you are swimming in a dirty or unchlorinated pool, you could be more at risk of developing an eye infection. 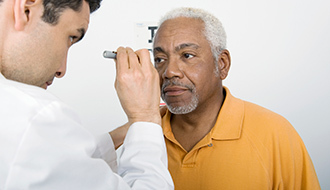 Eye infections are usually treated with prescription antibiotics, eye drops, ointments, or compresses, depending on the doctor’s evaluation of your case.